Crenshaw melons typically weigh between 8 and 10 pounds. 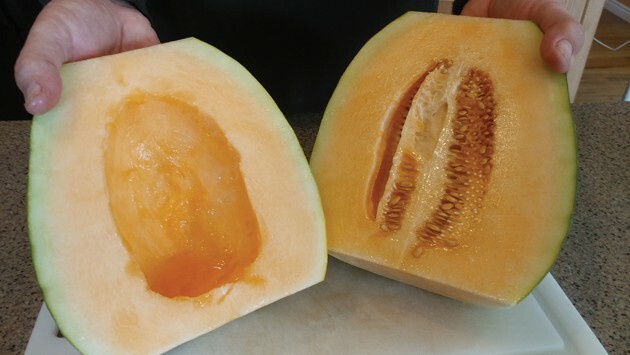 The flesh of a Crenshaw is similar to cantaloupe and is very sweet and moist. I enjoy the changing of the seasons, but I have to admit that as the active growing season comes to an end, it’s a bit sad for me. Don’t get me wrong. There were days over the last few months when I couldn’t keep up with the garden’ demands and longed for a less pressing schedule. Yet, I like having productive work to do, and the garden certainly provides that. 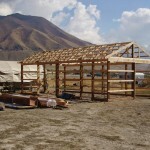 It’s also gratifying to prepare meals and snacks from what have been grown in the vineyard, orchard or garden. As the season winds down, my attention turns to other things, but not before we address the bounty the garden has provided. We’ve harvested the last of the tomatoes, squash, eggplant, jalapenos, bell peppers, and watermelon. 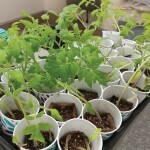 In the short term, the tomatoes will become caprese salad, or a key component of a BLT, sliced, salted and eaten fresh, or perhaps some tomato soup. Beyond all the items I’ve just listed, there’s a newcomer to our culinary and gardening experience this year. This addition has been a pleasant surprise. It’s ironic that we are now enjoying a new item on our plate because of a mistake. 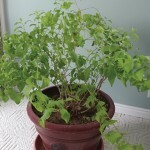 When I was starting seeds in the spring, I had obtained varieties locally as well as from a well-known national supplier. I had ordered some new items from its catalogue that I wanted to try but aren’t readily available here. I started the process by getting organized and listing out all of what I had and noting what was planted in which flat. I even put the seeds into a muffin tin so I could easily sort them and gauge how many I had of each. All was going well until about the middle of the process. I had several tins with seeds in them and accidentally knocked one of them on the floor. Talk about gardening bedlam! There was an unlikely mixture of all sorts of sizes, colors and shapes all over the floor. I did my best to gather and re-sort them, and I had to refer to my listing to determine what I was most likely looking at. Unfortunately, the tray had different melons, as well as cucumbers. I grouped them the best I could and went from there. Later, in the seed starting process, I had seedlings that I thought were cucumbers. Once hardened, I planted them in one of our raised beds that has a heavy duty panel of hog fencing in the middle of it affixed to sturdy metal posts. Those “cucumbers” grew speedily and began their ascent up the wire grid. Next, a plentiful supply of small blooms appeared, which the pollinators readily worked. Soon, small green fuzzy fruits came forth. Then, their shapes began looking somewhat like a light bulb. 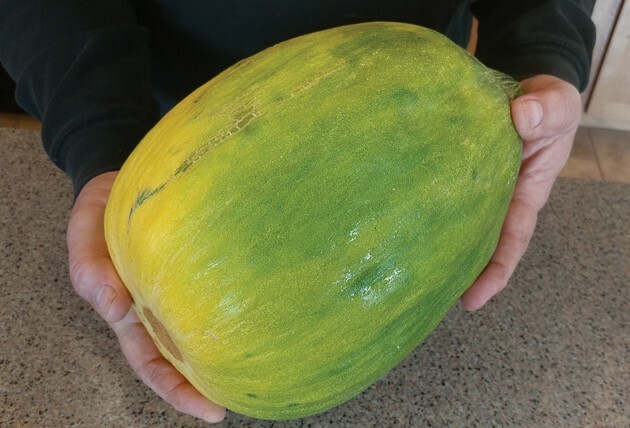 When the somewhat oblong and blocky fruits got bigger than muskmelons, I went on the hunt to see exactly what we were growing. I searched my order archives and found an entry for a melon similar in taste to the cantaloupe. I dismissed it — these just didn’t look like any cantaloupe I’ve ever seen. There wasn’t any typical webbed or mottled surface; these were glossy green, and as big as a small watermelon. That’s when I took another look at the “cantaloupe” I ordered and saw that I had obtained a variety I had never experienced. What we had were Crenshaw melons. I don’t know what happened to any of the cucumbers I had started — apparently, none of them made it. But, these sure did. Those of you who are familiar with the Crenshaw variety know the value of what we discovered. When the first melon ripened and we sliced into it, the sweet aroma was incredible. The flesh is moist, and the flavor is remarkably intense. This variety is a hybrid cross between the Casaba and Persian melons. While the taste is much like cantaloupe, we’ve found it to be even better. As much as I like cantaloupe, that’s saying a lot. It’s almost as if the “volume” has been turned up on the flavor. It’s quite moist too, without being mushy. A couple of other attributes we enjoy is that it’s easy to grow, is quite prolific, and each melon is sizable. The ones we grew are approximately 8 to 10 pounds each. That’s enough to prepare a generous bowl of cut fruit for the breakfast table or for a midday snack. We’ve taken this melon to social gatherings lately, as well as served it to guests with the same reaction — “where did you get this? This is incredible!” Apparently, the Crenshaw is a newcomer to many people, just as it was to us. Today, I harvested off all the remaining melons, and we had 19 to enjoy. But my beekeeping friend, Dave, stopped by tonight for a visit, and he ended our visit walking out to his truck with one of those Crenshaws under his arm. We’ll just have to tough it out with the remaining 18. As you can tell, I’ve become a bit of a Crenshaw evangelist. I heartily recommend that this be added to your garden next year. You can grow them vertically, as we did this year. I was able to support the sizable melons on the fence panel by creating slings of nylon mesh and S-hooks. The mesh is the type that is used for zipper bags to wash delicate or small items in the washing machine, or used for gear bags for camping or the beach. I found this tough mesh at a local fabric store, and got the S-hooks in bulk online. However, there were several melons that weren’t supported in a sling, and they did fine as well. You can obtain the seed online, and it’s possible they will be on the local seed racks come spring-time. It could be that I just didn’t see them last spring because I wasn’t really looking for them. I do know you can get them from either Burpee or Johnny’s Seeds. The planting directions recommend they be planted in hills and allowed to sprawl on the ground. If you have room, that will certainly work. But, if you need to contain them a bit to a smaller space, give a sturdy trellis, in a sunny spot, a try. I can tell you this much: The Crenshaw will be a part of our food plot ongoing and will be one of the things we’ll look forward to each year. Now, if I could just get every mistake to turn out as awesome as this one did.